THE DEAD DAISIES Release New Animated Music Video For "She Always Gets Her Way (All The Same)"
Anime-style was something the band and management have loved for a long time and this was the perfect moment to try out that format. It is such a positive, funny and light-hearted rock story, it just seems like the right thing to release with all the dark things going on in the world. The lyrics of the song were the main inspiration for the video. Watch the new animated video for "She Always Gets Her Way (All The Same)" on KNAC.COM right HERE. 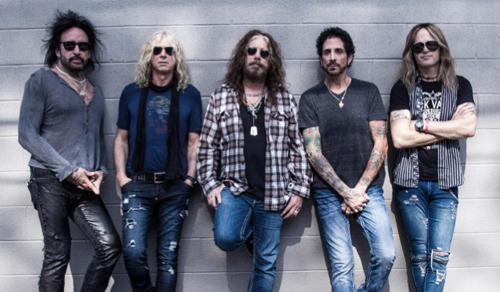 THE DEAD DAISIES are currently in New York songwriting and are headed to Nashville straight after to begin recording the new album with Marti Frederiksen. They will be releasing new music and Rocking The Planet in 2018. THE DEAD DAISIES play their own brand of infectious rock and give people an authentic slice of a 70s Rock Concert Experience whenever they perform. The band is comprised of massive music fans, they don’t take themselves too seriously and put the audience & music first which helps them create an explosive live experience. Featured on this track are: Doug Aldrich (WHITESNAKE, DIO), John Corabi (MOTLEY CRUE, THE SCREAM), Marco Mendoza (THIN LIZZY, WHITESNAKE), Brian Tichy (OZZY OSBOURNE, FOREIGNER) and David Lowy (RED PHOENIX, MINK).